Handwritten planning interior bathroomthe room is quite complicated, but interesting task. 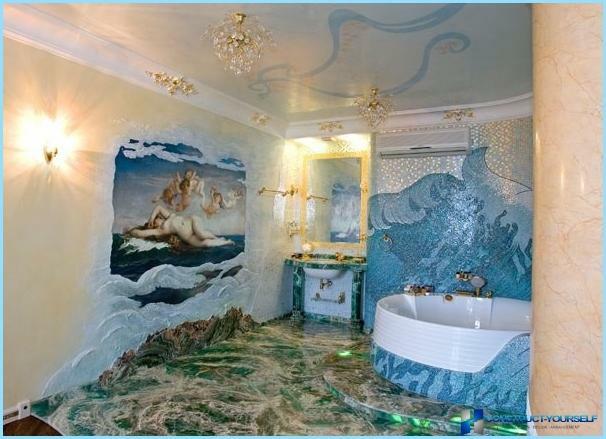 Unfortunately, not always en-suite has a large area required to create in it a true oasis of comfort and "relaxation". 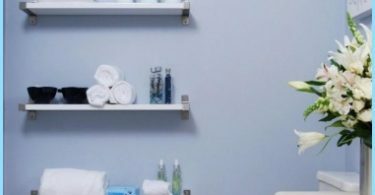 Especially in small bathrooms can "boast" the owners of apartments in the Khrushchev - correctly plan an easy and elegant interior is not easy. If you are working with a large room small defects may remain invisible to outsiders, small room requires the use of error-free decisions. 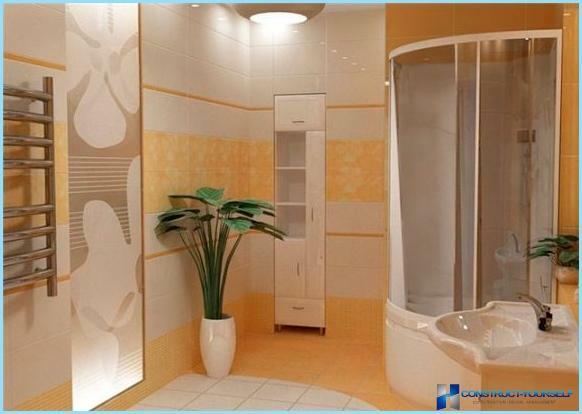 The small bathroom has a valuevirtually every detail - from the color of the walls, to the use of accessories. A special place in the interior of the bathroom furniture covers - it is one of the most important elements of comfort and style. Her choice, although there is an abundance, is not as simple as it might seem at first glance. Before buying you need to evaluate not only the materials of which it is made, but also how it will look organically in the "complex" with the existing walls, ceiling and floor in the bathroom. When choosing furniture it is worth remembering and about anotherAn important aspect - its color. Despite the fact that in a small room, usually more appropriate light shades of furniture, under certain conditions it is allowed to use the dark, rich colors. For example, maroon bathroom furniture in the interior of a small bathroom, if the walls are several times lighter, and the furniture is not too massive. An excellent option would be furniture, fixed on the walls, and do not place on the floor. Most of the bathrooms are made entirelystandard, though there is some unspoken limit - cabinet under the sink, several floor lockers, mirror, laundry basket. This set is often "crowned" an ordinary ceramic tile on the floor and walls. The approach to lighting is also no different variety - one or two lamps on the ceiling and the side mirror lights. This approach to interior design does not allow to create an atmosphere suitable for relaxation and stress relief. When planning a new interior, you should start fromown preferences, without taking into account the existing stereotypes. In order to create their own interior bathroom was harmonious, all work performed must be carefully planned. Ideally. You can use a special computer program, where you can "try on" different options of the furniture arrangement, color of the walls and the floor, place the desired accessory. If this is not possible, you can simplytry to draw their future bath. It does not need to possess skills because the main thing here is not accurately display the form and fine detail, and overall color scheme. Thus it will be possible to determine in advance the optimal combination of colors of the walls, flooring and most furniture. Do not be afraid to experiment, if the soul "asks" the black furniture, it can be installed and, by making the surface of the walls and the floor as much as possible light and bright room lighting. Choosing furniture for a small bathroom,the design of which is still not completely clear for the hosts, will inevitably have to choose between functionality of furniture and its style. 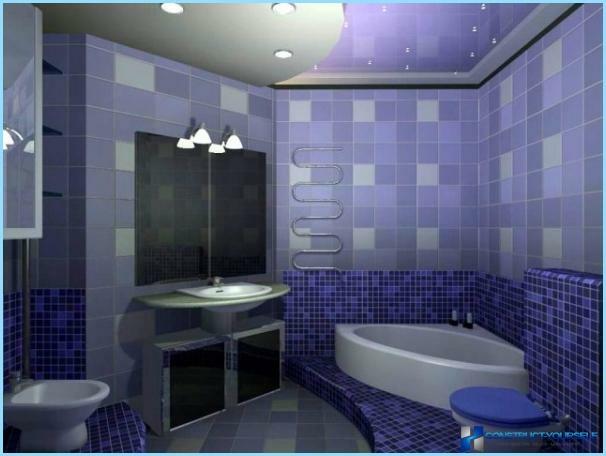 Such difficulties hardly feel happy owners of large bathrooms, where you can easily put all the attributes of comfort. To make a small bathroom comfortable and convenient for everyday use, it makes sense to think about making furniture for his own sketches as finished search options that would meet current needs completely flat, can be sufficiently tightened. 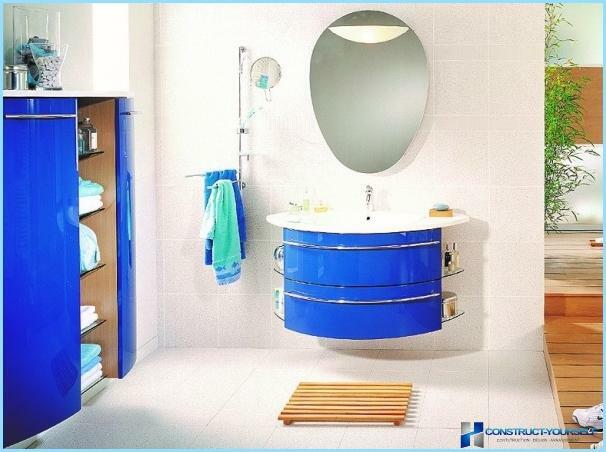 For a small space is very convenient cornerbathroom furniture, which is set in such a way that the corners of the room are involved, which in most cases is simply not used. It is undesirable to use in confined spaces furniture made of plastic, as well as furniture that is installed directly on the floor, ie without legs -.. This space visually heavier. 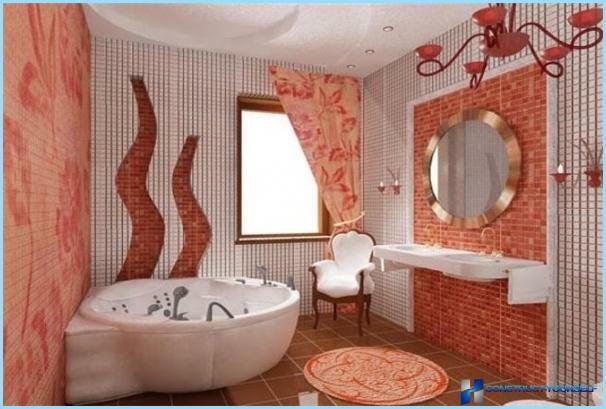 It is for the small bathroom the best use of suspension sets of furniture. 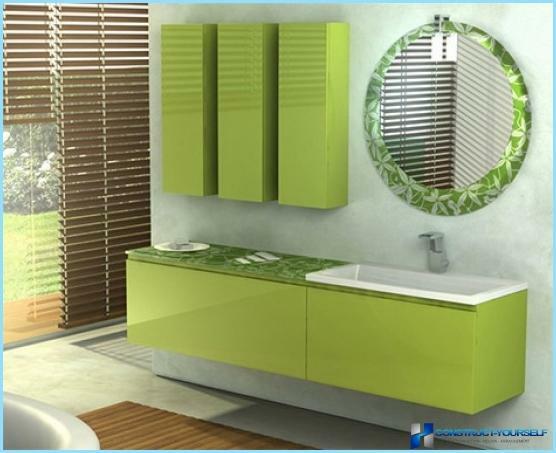 Particular attention should be paid to the selection of furnitureits functionality - such nuances as smooth closing doors, presence of multiple branches in the cabinets, furniture anti-corrosion or anti-mist mirrors significantly increase user comfort. In addition, a small bathroom, you can move away from the conventional design standards, and completely abandon the vertically mounted furniture. It can be replaced with usp5ehom horizontal modules attached to the walls. They did not differ in terms of tonnage of standard cabinets, but looked much more refined and interesting. 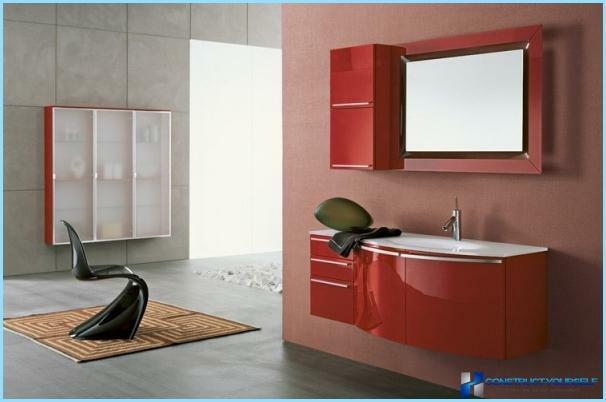 If the design of bathroom furniture is easyinvent itself, it is also easy to come up with an original way and its placement. Of course, if the bathroom is small, the furniture will be placed only along the walls - there is simply no other options. If the suite allows you to, and you can experiment. Of course in the center of the bathroom cabinet to place is not quite appropriate, but there is in place a "recessed" into the floor bath is quite possible. Thus, the room is not only acquire an interesting design, but will also allow owners to use a maximum of furniture placed along the walls. This will significantly increase the functionality of the room. Bathroom Lighting should also be given toa lot of attention. It is desirable to provide for its "multi-level" - this solution is equally appropriate for both large and small bathrooms. Depending on the stylistic direction of the ceiling can be placed a massive chandelier, a small lamp minimalist, and if multi-level ceiling, you can use the built-in lights. Additional light sources are mounted on the walls - at the level of 100-180 cm from the floor. Their role may make small directional lighting fixtures or sconces neat. The third type of illumination becomes a mirror lights. You can use a light selection of interesting accessories. 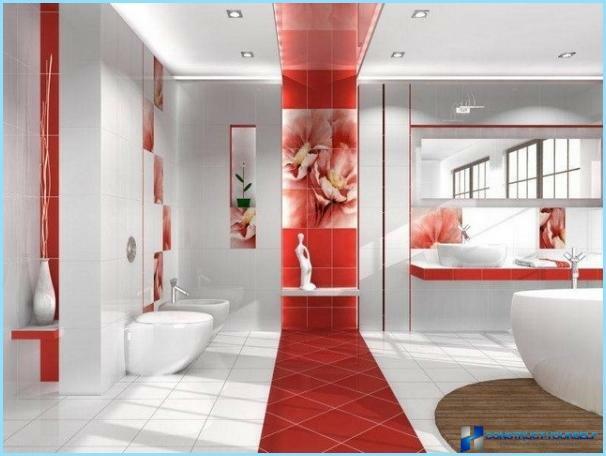 Despite the existing diversity amongfloor coverings, bathroom remains the best granite or ceramic tiles. The greatest strength and durability of granite is different. Working with them is not too much trouble, and its resemblance to natural stone flooring makes a rich and elegant. Together with granite can use the system of floor heating. Porcelain tiles will fit into any interior, even the very small bath, it comes in many colors, are polished and matte variants - are increasingly exclude the possibility of slipping. Despite the evidence of use in the decorationwall tiles, now there are plenty of alternatives. For example, a variety of decorative plaster with water-resistant characteristics. They allow you to simulate virtually any surface - from suede and wood to stone, easily tintable to any color, work on their application is different complexity, and can be performed independently. When choosing the color of the walls should be possible to correlate it with pieces of furniture and the floor, because it is the color of the walls is decisive for the room. 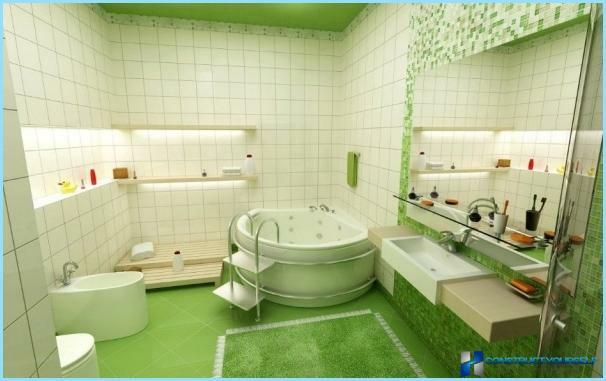 Do not use very intense, saturated colors - being in a bathtub will be tiring. In order to eliminate the possibility of dissonance with the restinterior, you can leave the cap in classic white. If the owners of the bathroom is not alien to the spirit of innovation and not afraid of change, the ceiling can be made in color. 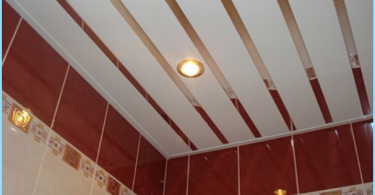 Of course, not every bathroom ceiling appropriate saturated color, but if it is large, the presence of windows, light walls and the same furniture, saturated shade of the ceiling can be a good decoration of the bathroom.